The statement was reinforced by statements NASA Director Michael Griffin said in an interview with a local radio in the U.S. recently, which shows the director doubts that global warming is the biggest challenge to be overcome humans. In the interview, one of Griffin's statement that the passage quoted is a lot later, "Earth's climate today is the best climate that we have ever had." Is it true that global warming is truly the result of human activities that are too greedy to exploit the earth's natural balance and sloppy? 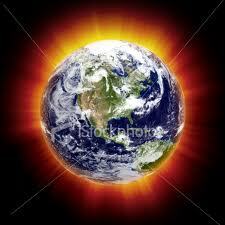 Is global warming and climate change is the most important things that must be overcome man? Inhofe presented a variety of facts and quotations that support his argument. According to him, the media plays an important role in issues that are not properly animate it. He also expressed penelusurannya to report some of the leading media such as Newsweek, Time Magazine, The New York Times, Chicago Tribune, and Journal of Science News. He found, these media in the era of the 1900s precisely to report concerns about the coming ice age, instead of heating or melting of the ice. Until the period 1920-1930's until the late 1970's, the leading media in the U.S. was still very vigorous preaching and report hazards Earth changes into a ball of ice. He was harassing the Kyoto Protocol, a protocol was signed by most countries under the earth in order to reduce emissions of greenhouse-gas formers in which the U.S. refused to sign it, as the agreements and solutions that mean nothing in order to reduce emissions of harmful gases into the Earth's atmosphere. According to him, the most effective way to reduce these gases is the use of gas cleaning equipment and technology that is more efficient to suppress the gas scattered into space. But political motives Inhofe statement did not dampen the global movement around the world that the threat of global warming is real and must be fought from now on by all parties. Inhofe, Republican politicians, as well as U.S. President George W. Bush is also of the Republican Party, obviously do not want their interests piqued because of the disturbed must suppress greenhouse gas emissions in the U.S. most of the power generated from fossil energy (oil, coal). Not only Inhofe and Bush is being "ignorant" to climate change. More than 17 thousand scientists - two thousand more of them are physicists, geophysicists, climatologists, meteorologists, and environmentalists-signed a petition circulated by the Oregon Institute of Science and Medicine in the U.S.. One sentence in a petition that states, "There is no scientific evidence that the release of carbon dioxide gas (CO2), methane (CH4), and greenhouse gases that cause warming more acutely on the temperature of the earth and damage to the Earth's climate." Regardless of the fact and a political statement expressed above, the following facts speak far more powerful and real, showing where the direction of climate change on earth is going towards and empties. We start from a far with us, the Arctic Sea. Oceans is largely recognized as the ocean ice. Scientists are observing changes in sea ice was noted an increase in heat two times faster than the warming at the global level. Since 1980, Arctic sea ice is located in the euro area has melted between 20-30 percent. Still in Europe, the mountains that had been Alpens mostly snow covered with snow deposits experienced a severe downturn. Eight of the nine areas of glaciers / glacier showed a significant degree of damage and within a century has lost a third of the ice. Not only in Europe, the entire plateau in the world which is known to have also melted tip of the iceberg. The snow on the highest mountain peak in Africa, Kilimanjaro, melt every month no less than 300 cubic meters. Mountain, located in Tanzania is suffering from severe snow baldness when comparing aerial photographs taken in 1974, 1990, and 2001. In the period of a century of observation, the snow on the mountain melt until it reaches 82%. When the snow no longer feel at home perched on top of the mountain, the mountain's name may be changed, because of Kilimanjaro in the local language means mountain or mountains that glow white. Let's move to the area that gave birth to many artists ball, South America. Snow in countries such as the high berdataran like Argentina, Peru, Chile also dropped dramatically. Andes Mountains, one of the paradise of snow in the world, having melting snow toward the mountain peaks are very significant. Between 1963 and 1978, the snow melted an average of 4 meters per year, and since 1995 until now, melting snow to reach speeds of 30.1 meters per year in the entire region containing glacier. While in Venezuela, the largest domestic producer of Miss World, held from 6 glacier country in 1972, now only left two more, and will be lost at least 10 years from now. Consequences of melting snow is rising sea levels, first in the region. In Brazil the country sphere, the shoreline is lost into a sea of ​​average ranges from 1.8 meters per year during the period between 1915 to 1950 and increased to 2.4 meters per year during the period of ten years between 1985-1995. What happened in Asia, also in Indonesia, due to global warming? The same thing that happened on another continent, snow, snow in the highlands of Asia experienced a drastic melting at once dramatic. Himalayas, the highest mountain in the world to be a bag of frozen water on the "roof of heaven" snow continues to lose consistently. Glacier, a glacier in the Himalayas that are spread in countries like India, Tibet, Bhutan, China, degraded very quickly. Seven major rivers in Asia that edged the water from the Himalayas namely Ganga, Indus, Brahmaputra, Mekong, Thanlwin, Yangtze and Yellow River threatened their existence that resulted in hundreds of millions of human beings in the area along the flow of the rivers. Not only in South Asia region, the snow in Central Asia also continues disappear one by one. It happened also in Puncak Jaya, Papua, the only high mountain regions in Indonesia that has snow. When the aerial photographs in 1972 showed that almost all the mountain peaks covered with snow, now it just contains the top of the mountain rocks and trees alone. That is, there is no snow there. Melting ice revealed above is just the part of the truth. Based on the last report the Intergovernmental Panel on Climate Change (IPCC), released last year 2007, 30 snow in the mountains around the world lost a thickness up to more than half a meter by the year 2005 alone. The last two years have not been included in the report. Since energy is conserved, snow was on its own is not lost and the only changes form. Like ice in a glass, when he was exposed to heat and melt, the volume of water it does not decrease or increase, but only changed. Thus, the first consequence of rising global temperatures are melting the snow and water deposits had been a growing increase in the water in the earth's surface. This increase can be detected in all corners of the earth and proven through a number of aerial photographs which compares a region in decades past with contemporary conditions. However, the consequences of rising global temperatures are not that simple. Ecological changes that occur in environments where humans and other living things life takes a terrible impact for mankind. Law of physics states, the wind moves from a cold place to a more heat. Well, the difference in temperature of a region with other areas that are very extreme at the same time has triggered the emergence of typhoons, hurricanes, and tornadoes become more frequent than a few years ago. Countries in North America, Central, South and Caribbean, Europe, South and East Asia also have felt the impact of this hurricane. Cyclones which have beautiful names hit people across the earth are at once heartbreaking and deadly. Flow of water movement not only brought the flood disaster, but also accompanied by landslides caused by deforestation that takes place every minute. At the same time, parts of the world that one is threatened drought and fires, other places hit by hurricanes, floods and landslides that afflict hundreds of millions of mankind. Drought in the Kidul Mountain area, for example, might have become a fact plural which takes place every year and has since many years it happened. However, water shortages experienced by residents on the slopes of Mount Merapi last five years for example, of a new fact which shows how much water the more difficult to obtain. The difficulty of vegetable farmers on the slopes of Mount Merbabu for example, also something that still sounds strange. Grojogan Sewu is still spill the water. But compared to fifteen years ago, for example, Grojogan it now has turned into nothing more than a shower. Some twenty years to come, may he live to droplets only. That's just from the scarcity of water. In terms of climate change, all the cities and regions in Indonesian became its victim. In central Java example, Kaliurang in Jogjakarta, Tawangmangu in Karanganyar, or Bandungan in Semarang, now no longer visited by tourists because of the cool air and cold, but because of the stigma terlanjut kelatahan and attached as a tourist area. That's it. Formerly, in these areas is always cold mist down every morning throughout the year. Now, he could only be found several times throughout the year, that would greatly depending on the season. In Puncak Jaya, Papua, the snow is no longer perched on its peak since a few years ago. This marks the end of the era of the existence of only one snowy regions in Indonesia. And this at once proves that the earth is getting hot is not crap but the fact of actual facts. Ironically, the situation is more hot air, then people look for ways to cool it, but only for themselves. Cooling air is a pragmatic choice for this, but even this tool could be reached only by a layer of upper middle class society. Poor people obviously can not escape from the swelter. Ironically, the use of air conditioning more massive and intensive in most households in urban areas cumulatively actually encourage the creation of the earth is getting hot due to the gases produced by the air conditioning is not environmentally friendly. It had been so, the intensive use of air conditioning was also triggered increased demand for electricity continues to grow-which again ironically, while the electricity is produced using fossil fuels are not friendly to the environment and give the largest contribution to global warming. This vicious circle leads clearly the poorest people and do not have access to sufficient economic resources to be victims. The number of people who increasingly excluded from this circle will undoubtedly continue to grow because of the feud and agree on concrete efforts to combat climate change is having an acute impasse.